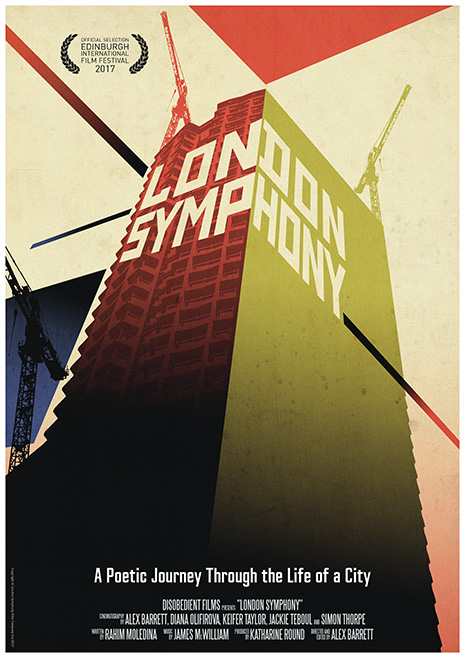 LONDON SYMPHONY is a brand new film with stunning cinematography which offers a poetic and exciting journey through the people and architecture of the city of London. The film has been nominated for the Michael Powell Award for Best British Film at the Edinburgh International Film Festival 2017. It will be screened with a live chamber orchestra performance by the Covent Garden Sinfonia who will be performing a new musical score composed by James McWilliam. COVENT GARDEN SINFONIA: Under the baton of Artistic Director Ben Palmer, CGS has developed a reputation for imaginative programming and exciting, stylish performances, equally at home playing a Haydn symphony as accompanying a silent film. Resident at the famous Actor’s Church, St Paul’s in Covent Garden, central London, CGS performs regularly at Southbank Centre’s Royal Festival Hall, Queen Elizabeth Hall and Purcell Room, St John’s Smith Square, St Martin-in-the-Fields, Cadogan Hall and Barbican Centre’s Milton Court. Includes Q&A with director Alex Barrett.